Read this review on ELK Studios powered, The Wiz Slots game and know how to win Free Spins and multiplier bonuses. A new slots game is up on the blog at ELK Studios, its called 'The Wiz'. This online slots machine was launched on the 19th of January this year and has 5 reels, 4 rows and 178 paylines. The game is rightfully named, 'The Wiz' as it is doing justice to the fact that W, I and Z are at the 23rd, 9th and 26th place in the alphabetical order while A, R and D are at the same positions when we count them from the reverse side. Also, 'Wizard' is an English version of the Middle English word, 'Wysard' which means 'a wise man'. 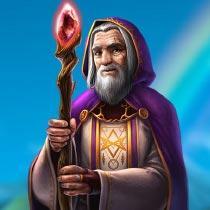 And in this slots game, this wise man aka the Wizard is casting his magical spell turning everything to gold which directly implies, higher winnings. But beware the dragon as he will set ablaze everything he touches. Take a free demo of this stunning slots machine and do make sure you are playing it for real money as for the real money players, the first mobile gaming studio, ELK has brought numerous bonus features. Free Spins, Multiplier bonuses, low paying symbols swapping with the high paying ones are some epic Bonuses that 'The Wiz' slots game is offering. Read on to know more about what the Wizard holds for you. How to play The Wiz Slots Game? Launch the game onto your playing device and choose to play for real money. At the bottom left hand corner, there is a coin selector symbol. You can choose your bet value by clicking on this button. Players can also strategize their play by selecting any of the betting strategies mentioned below. €0.20 and €100 are the minimum and maximum stake value that can be placed. A game round shall start on the selected bet level as and when the player clicks on the 'Spin' button. There are 100 Auto Spins to choose from the 'Autoplay' button. Auto spins can be selected from the 'Auto Spin' button which will automatically start the chosen number of auto play game rounds. Total winnings of a player will be presented either in coins or in the player's chosen currency. At the maximum, players can win 500,000 coins in this game. Optimizer: At this level, the real money players can change their bet level automatically by adapting to the selected percentage of their balance. The bet percentage of balance that players can select ranges from 1% to 10%. Leveller: This betting strategy allows the player to raise their bet level by 2 places after 5 consecutive losses. Any repetition will increase the bet by 2 more levels. For instance, your bet is raised 10 times the base bet upon selecting this betting strategy. Also, after every win this strategy will be reset. Booster: Choosing this betting strategy will raise the bet by 1 level after a loss until 4 levels above the base bet. Like, bet raised to 10 times the base bet. This strategy will also be reset after every win. Jumper: After every winning round, the bet will be raised by 1 level until it reaches 4 levels above the base bet. For example, to 10 times the base bet. This betting strategy will be reset after every loss. Bet lines shall be paid from left to right and the highest win per bet line shall be paid out. In this game, 12 bet levels are offered for every currency and every bet shall have 100 coins. The Wiz slots game is available for playing in two modes – Normal Mode and Bonus Mode with Free Spins. Winnings shall be credited after the Bonus Mode concludes and all the winnings shall be paid in accordance with the Payout table. Bet value cannot be changed during Bonus Mode or an ongoing spin round. During any malfunction, all bets or wins shall be void. The Wiz slots machine is tremendously innovative with superb Bonus features triggering massive winnings to the real money players. ELK Studios, the software that backs up this game, has loaded the game with some exceptional features. The theme of this slots game centers around the magical Wizard that takes the real money players into his mysterious and enigmatic world where metal artifacts are in play. The payout symbols are comprised of these artifacts which beautifully represent the medieval era. The background score is also very suspicious, hence, making the game even more exciting and thrilling. Wild Symbol: The dragon is the Wild symbol in this slots game. Except the Bonus symbol, Wild shall substitute for every symbol in this game. It will also act as a walking wild symbol and will also multiply a player's winnings by 2x – 5x. Scatter Symbol: The Wizard himself is the Scatter symbol and when its appears on a winning combination, it shall trigger a Free Spins Bonus game round. Standard Reels Symbols: There are 8 standard reels symbols in The Wiz slots game. Four of them are high paying while the other four are low paying symbols. The High Paying Symbols are – Sun, Moon, Treasure Chest and Potion Bottle. The Low Paying Symbols are – Metal artifacts such as Ring, Brooch, Key and Spoon. The Wiz slots game is powered by none other than the recently launched software company, ELK Studios. ELK has always claimed that they are a small company which began its journey in the year 2012 but going by the facts, then the mobile slots and other casino games by ELK Studios are gaining all the limelight. Most of the online games by this software developer have managed to carve a niche in the hearts of all the real money players. Birthday!, Joker Gems, Poltava are some of the brilliant slot games that ELK has designed, specially for the mobile users. And this January, they have launched one more online slots game, 'The Wiz' which is sure to enthrall you at every step. Players can spin the reels of this mysterious yet engaging slots machine in free mode and in real money play mode. If the player is playing in the Bonus mode, then getting one Wizard symbol across the reels will trigger 1 extra Free Spin. Similarly, getting two, three, four and five Wizards will trigger 2, 5, 7 and 10 extra Free Spins. The frequency of the free spins bonus is artificially increased so as to benefit the real money player. During Free Spins Bonus mode, all the low paying symbols will swap to become their corresponding high paying symbols. This implies that the Spoon will swap to become Potion Bottle, the Key will swap and turn into the Treasure Chest while the Brooch and the Ring will transform to become the Moon and the Sun. The Wild symbol i.e. the fierce dragon will get triggered as the Wizspins feature starts. This dragon acts a Wild multiplier in both the Normal and Bonus modes. Since this Wild (dragon) symbol is a random multiplier ranging from 2x to 5x. Thus, a real money player's winnings will get multiplied accordingly. This multiplier will apply to all the connected paylines in this slots game and if on a connecting payline, there are multiple dragon symbols, then all of them shall get added to the total applied multiplier. During the Bonus mode, the Wild dragon symbol will become a walking Wild symbol moving leftwards, one reel per spin. All the dragon symbols will retain their bonus multiplier and will keep on moving till the time the wild symbol (dragons) leave the slots screen. As the wild dragon symbol will leave the screen, the paused free spins round will resume automatically. The Bonus mode will finally come to an end when there are no dragon symbols visible, neither are there any free spins left or if maximum winnings i.e. €500,000 has reached. Summarizing this amazing slots game, we can say this is yet another masterpiece by ELK Studios. 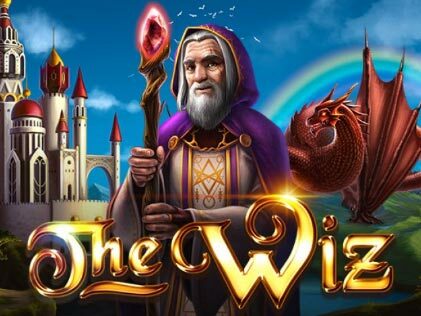 The provider has always delivered unmatchable casino games and now by launching 'The Wiz' slots, ELK, the first mobile studio has added yet another feather in their cap. This newly released slots machine has a mysterious plot which opens the door for massive winnings up to €500,000. Plus there are abundant Bonus features, Free Spins bonuses etc in this slots game. The graphical interface of 'The Wiz' slots is also very well designed and developed and the background music will keep you glued to your playing devices. We recommend playing this slots game for real money because ELK is known to produce high payout generating games. Please enter your review for the The Wiz Slot.